Reading Barbara Pym is like drinking a cup of warm tea in a window seat, even if you're actually jammed on a crowded subway platform watching the third train in a row bypass your station. Her bittersweet observational humor is always spot-on and makes you laugh in that way reserved for things that are just so true. ExcellentWomen is considered the best of Pym's novels, but please, don't make me choose! One of Barbara Pym’s richest and most amusing high comedies, Excellent Women has at its center Mildred Lathbury, a clergyman’s daughter and a mild-mannered spinster in 1950s England. She is one of those “excellent women,” the smart, supportive, repressed women who men take for granted. As Mildred gets embroiled in the lives of her new neighbors—anthropologist Helena Napier and her handsome, dashing husband, Rocky, and Julian Malory, the vicar next door—the novel presents a series of snapshots of human life as actually, and pluckily, lived in a vanishing world of manners and repressed desires. 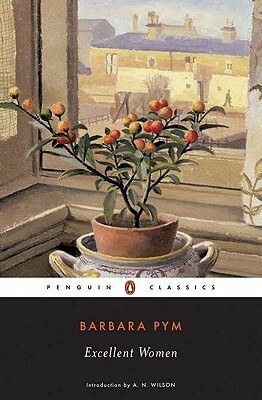 Barbara Pym (1913–1980) was a British novelist best known for her series of satirical novels on English middle-class society. A graduate of St. Hilda’s College, Oxford, Pym published the first of her nine novels, Some Tame Gazelle, in 1950, followed by five more books. Despite this early success and continuing popularity, Pym went unpublished from 1963 to 1977. Her work was rediscovered after a famous article in the Times Literary Supplement in which two prominent names, Lord David Cecil and Philip Larkin, nominated Pym as the most underrated writer of the century. Her comeback novel, Quartet in Autumn, was nominated for the Booker Prize. A. N. Wilson (introducer) was born in 1950 and educated at Rugby School and New College, Oxford. A fellow of the Royal Society of Literature, he has held a prominent position in the world of literature and journalism, winning prizes for much of his work and contributing to the London Even Standard, Times Literary Supplement, New Statesman, Spectator, Observer, and Daily Mail, among others. He lives in London.